Keywords: Parkinson Disease; Sleep; Dopamine Agonists; Pedunculopontine Nucleus. Objective: Our study aimed to develop a survey that could be used by nurses during regular cystic fibrosis (CF) clinic visits, providing clinicians with a standardized means of longitudinally assessing and monitoring symptom progression in their patients. In addition, the use of this survey would provide an opportunity for patient engagement and relationship building, thereby enhancing patient education and improving adherence to treatment. This is the first such survey designed specifically for use in Arab populations. Methods: The Cystic Fibrosis Symptom Progression Survey (CF-SPS) was developed using previously published patient reported outcomes relating to pulmonary exacerbations in CF. It contains 10 items that provide a patient-focused account of symptoms. The survey was translated into Arabic and was completed by 12 patients on 139 occasions over 22 months. The psychometric properties of the survey were evaluated, as was the relationship between the survey findings and other known clinical measures of health status in CF. Results: The CF-SPS performs well as a psychometrically valid clinical tool, with good internal consistency as determined by Cronbach’s alpha analysis. Our results suggest that the CF-SPS is able to identify significant declines in health status in line with routine clinical patient assessment (chest sounds, body mass index and admissions). As such it is a useful tool that can support clinical decision making in the care of Arabic speaking CF patients. Conclusion: We recommend the CF-SPSa (Arabic version) as a valid tool for the longitudinal monitoring of symptom progression in CF in Arabic speaking populations. 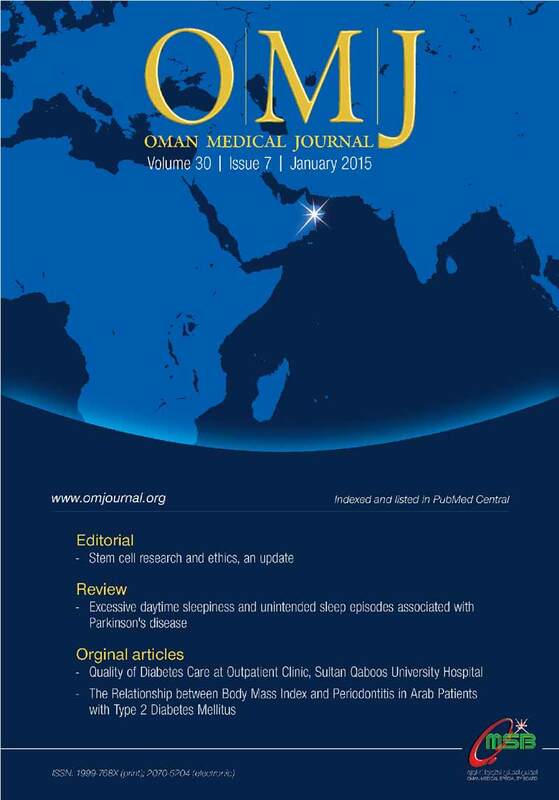 Cystic Fibrosis; Oman; Survey; Disease progression; Arabic. Objective: The purpose of this study was to assess the impact of acne on the quality of life. Its secondary objective was to assess the influence of gender of students and severity of symptoms on the quality of life. Methods: A cross sectional study was conducted on 100 students at Sultan Qaboos University (SQU) (40 males and 60 females) diagnosed with acne who attended the Student Clinic during a period of three months from September to December 2009. The Acne Quality Of Life index (Acne-QoL) questionnaire was used to assess the patient’s quality of life in four different domains: self-perception, social, emotional, and acne symptoms. Results: Acne affected all areas of the patients, quality of life with the emotional domain found to be the most affected. Overall, female patients reported more adverse QoL effects. The mean score for self-perception for female students was 2.5 and 2.8 for males (p=0.300). The role-social domain approached a significant difference between genders (p=0.078). There was a statistically significant correlation between severity of acne symptoms and the other three domains. The correlation was highest between acne symptoms score and self-perception score. Conclusion: This study showed that acne affects the quality of life of affected SQU students treated by primary care physicians at the Student Clinic. Therefore, physicians should take into account the effect of acne on the persons’ quality of life when individualizing treatment. Acne vulgaris; Quality Of Life; University students; Impact. Objective: To assess the clinical care of type 2 diabetes mellitus (T2D) patients at Sultan Qaboos University Hospital (SQUH), a countrywide tertiary referral center in Muscat, Oman. Methods: We performed a retrospective, observational, cross-sectional study using a total of 673 Omani T2D patients from the Diabetes and Family Medicine Clinics at SQUH. We collected patient data from June 2010 to February 2012 from the Hospital Information System (HIS). Patients had to be Omani, aged more than 18 years old, and have T2D with active follow-up and at least three visits within one year to be included in the study. Ninety-three percent of the patients (n=622) were on oral hypoglycemic drugs and/or insulin, and 70% were on statins. Patients’ anthropometric data, biochemical investigations, blood pressure, and duration of diabetes were recorded from the HIS. Results: Using the recommended standards and guidelines of medical care in diabetes (American Diabetes Association and the American National Cholesterol Education Program III NCDP NIII standards), we observed that 22% of the patients achieved a HbA1C goal of <7%, 47% achieved blood pressure goal of <140/80mm Hg, 48% achieved serum low density lipoprotein cholesterol goal of <2.6mmol/L, 67% achieved serum triglycerides goal of <1.7 mmol/L, 59% of males and 43% of females achieved high density lipoprotein cholesterol goals (males>1.0; females >1.3mmol/L). Almost 60% of the patients had urinary microalbumin/creatinine ratio within the normal range. Conclusions: The clinical outcomes of the care that T2D patients get at SQUH were lower than those reported in Europe and North America. However, it is similar to those reported in other countries in the Arabian Gulf. Oman; Type 2 Diabetes Mellitus; Outpatient Clinics, Hospital. Objective: Our study sought to evaluate the association between periodontitis and body mass index (BMI) among patients with type 2 diabetes mellitus. Methods: In this cross-sectional case control study analysis of 186 diabetic patients, 112 patients had a body mass index >30kg/m2 and 74 control patients had BMI <30kg/m2. All participants underwent oral examinations including a full mouth recording of clinical attachment level (CAL). Information regarding HbA1c levels and high-sensitivity C-reactive protein (hs-CRP) were also gathered. Results: Over half (61%) of patients had a BMI >30. Of these 52% had CAL less than 2mm. Multivariate logistic regression analysis showed that there was no association between BMI and CAL. In addition, hs-CRP levels were significantly and positively associated with CAL (OR:1.06, 95% CI: 1.01, 1.12; p=0.007). Conclusion: Among patients with type 2 diabetes mellitus, there was no association between periodontitis and BMI. More studies are needed to further explore this relationship taking into consideration additional lifestyle factors. Objectives: Epilepsy is a common neurological disorder with a median lifetime prevalence of 14 per 1000 subjects. Sleep disorders could influence epileptic seizure. The most common sleep disorder is obstructive sleep apnea syndrome (OSAS) which occurs in 2% of adult women and 4% of adult men in the general population. The aim of this study is to estimate the frequency of OSAS among patients with epilepsy and to study the seizure characteristics among those patients with co-morbid OSAS. Methods: Patients with a confirmed diagnosis of epilepsy who attended the Sultan Qaboos University Hospital neurology clinic were recruited for the study between June 2011 and April 2012. Patients were screened for OSAS by direct interview using the validated Arabic version of the Berlin questionnaire. Patients identified as high-risk underwent polysomnography. Results: A total of 100 patients with epilepsy (55 men and 45 women) were screened for OSAS. Generalized and focal seizure was found in 67% of male and 27% of female patients. Six percent of the participants had epilepsy of undetermined type. Only 9% of the sample was found to have high risk of OSAS based on the Berlin questionnaire. No significant correlation was found between risk of OSAS, type of epilepsy, and anti-epileptic drugs. Conclusion: The risk of OSAS was marginally greater in patients with epilepsy compared to the general population with the overall prevalence of 9%. Objectives: Low-dose ketamine has been considered a good substitute for opioids for controlling postoperative pain. The purpose of this study was to determine the effect of low-dose intravenous ketamine following cesarean section with spinal anesthesia on postoperative pain and its potential complications. Methods: One hundred and sixty pregnant women volunteered to participate in this randomized controlled clinical trial. Participants were randomly divided into two groups (n=80 for each group). Five minutes after delivery, the experimental group received 0.25mg/kg ketamine while the control group received the same amount of normal saline. Results: There was a significant difference between the two groups in the severity of pain at one, two, six, and 12 hours following surgery. Postoperative pain was significantly less severe in the experimental group. Compared to the control group, the experimental group felt pain less frequently and therefore asked for analgesics less often. On average, the number of doses of analgesics used for the participants in the experimental group was significantly less than the number of doses used for the control group. Analgesic side effects (including nausea, itching, and headache) were not significantly different between the two groups. However, vomiting was significantly more prevalent in the control group and hallucination was more common in the experimental group. Conclusion: We conclude that administration of low doses of ketamine after spinal anesthesia reduces the need for analgesics and has fewer side effects than using opioids. Further studies are required to determine the proper dose of ketamine which offers maximum analgesic effect. Furthermore, administration of low-dose ketamine in combination with other medications in order to minimize its side effects warrants further investigation. Cesarean Section; Ketamine; Pain, Postoperative; Anesthesia, Spinal. Dabigatran etexilate is a recently approved direct thrombin inhibitor (DTI), which is superior to warfarin in the prevention of stroke and systemic embolism in patients with atrial fibrillation (AF). However, dabigatran use is associated with an increased risk of myocardial infarction (MI) compared to warfarin. The mechanisms for this association effect remain speculative. We present a case of an acute MI and cardiac arrest in a patient with chronic AF who had been recently switched from warfarin to dabigatran. Urgent coronary angiography, at St. Michael’s hospital (Toronto, Canada), revealed evidence of thromboembolism to the distal posterior descending artery. The patient was treated medically and switched back from dabigatran to warfarin. He did well and was discharged after an uneventful stay in the coronary care unit. Dabigatran; Direct thrombin inhibitor; Myocardial Infarction; Warfarin. Hughes-Stovin syndrome is a very rare clinical entity characterized by pulmonary artery aneurysms and deep vein thrombosis (DVT). Here we report the case of a 53-year-old man with bilateral pulmonary artery aneurysms and lower-limb DVT who developed massive hemoptysis. He was managed successfully with high-dose steroids in combination with cyclophosphamide. Behcet’s Disease; Hemoptysis; Hughes-Stovin syndrome; Immunosuppressants. Van der Woude syndrome (VWS) is a rare craniofacial anomaly with autosomal dominant inheritance and remarkable heterogeneity in expression. It manifests as lower lip pits with or without a cleft lip and/or cleft palate. The critical importance of lip pits is that their occurrence may be associated with a phenotypic severity of the cleft lip and cleft palate. The clinical manifestation of lower lip pits covers a wide spectrum. These include slight depressions on the vermilion border of the lip, and fistulas that penetrate into subjacent salivary glands and drain small amounts of saliva. Lip pits are usually circular or oval shaped, but have also been described as transverse, slit-like, or sulci. They may vary from an asymptomatic slight depression on the vermilion border of the lower lip to deep fistulas. The relatively high incidence in females has been attributed to the established fact that they are more likely to seek surgical intervention for cosmetic considerations. Cosmetic considerations are thus the most common indication for surgical intervention; however, some patients with asymptomatic lesions or mild symptoms may neither require nor request surgery. The goals of treatment are two-fold; removal of sinuses and providing cosmetic relieve for the disfigurement. The identification of familial lip pits is crucial for genetic counseling. Physical examination of relatives and interviews with older relatives are considered essential to identify affected family members. Information regarding the pattern of inheritance and the consequence of these phenotypes must be emphasized. Here we report an interesting case of VWS seen at the Ahmadu Bello University Teaching Hospital, Zaria, Nigeria, to highlight its peculiar clinical presentation and management. Van der Woude syndrome; Cleft lip; Cleft Palate; General Surgery.